This appointment usually takes about 30 minutes. After we study your health history and correlate your examination findings, we’ll make recommendations designed to help you get healthy again and how to stay that way, maintaining optimal health. We call this the Report of Findings. This is usually discussed on your second visit, which may be later on in the same day as your first visit, or on the following day. If x-rays were taken, we will explain our findings. In certain situations, and in the professional judgment of Sandra Davies, we sometimes make exceptions. It just depends on your unique situation. Ready to get started? 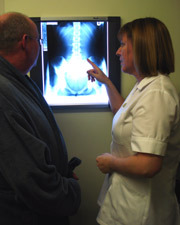 Please call to arrange a time so that we may meet you and discuss your particular health issue. 01793887801.